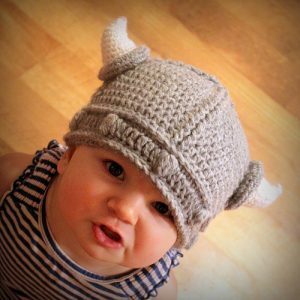 Babies are fragile—viking or not—and you need to keep them as warm and as sheltered as you can. With this new crocheted creation, you can do all that while staying true to his or her trouble-causing nature. Yes, as cute, cuddly, and as adorable as they are, we all know how much trouble they can create in an instant—much like real vikings: savage, barbaric, merciless. Makes for an adorable hat for photo-taking and is functional to keep babies’ heads warm, too. Available for newborns to up to 6 months. Gender neutral. Customizable to your favorite colors. Item is created only after purchase. Made from only yarn, fill material, and quality work. Ships worldwide. Follow the link below for the seller’s site.